The Green Party candidate says no money—or even words—were exchanged. 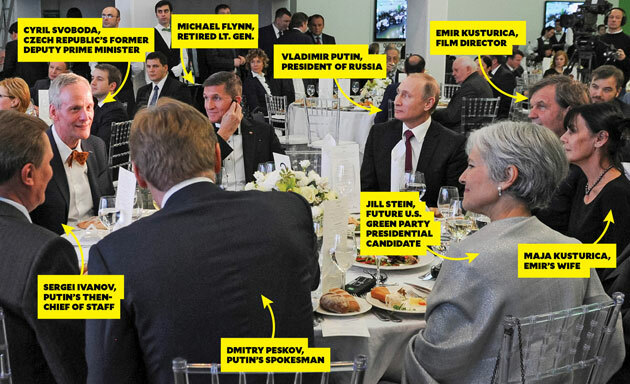 Gen. Michael Flynn and Jill Stein dine with Russian President Vladimir Putin in December 2015. “This is the Cuban Missile Crisis in reverse on steroids—in fact, on crack,” Stein says of the Trump-Russia scandal. Stein also says she had little idea who Flynn was, though she had a brief, friendly conversation in which she told him about her efforts to promote nuclear disarmament and build “a peace consensus.” That mission was the impetus for her trip to Moscow, she tells The Intercept. “There was nothing secretive about why I was there… The dinner had absolutely no relevance to my trip.” She emphasizes that she went to RT’s 1oth anniversary celebration to open a dialogue with Russians, even though she apparently did not try to speak with Putin about her agenda. However, she mentions that her trip was a chance to meet with other “peace advocates,” including former Minnesota Gov. Jesse Ventura. In response to Scahill’s questions about how Democrats have handled the Trump-Russia scandal, Stein suggests that liberals’ current animosity toward Russia is linked to attacks on her and Green voters for supposedly enabling Trump’s election win. “Because of the way the neo-McCarthyism is hooked up with the new Cold War and the anti-Russia surge, this is a very dangerous moment. We have our nuclear weapons on hair trigger alert,” she says. “This is the Cuban Missile Crisis in reverse on steroids—in fact, on crack.” Russia, she says, understandably feels “touchy” about perceived American belligerence. Asked what she ate at the RT dinner, Stein says, “I’m a fish-eating vegetarian…There were lots of great vegetable dishes and salad.” She says she doesn’t recall seeing any caviar.